Fine English Pewter Gifts are perfect for a special someone, or for the marking of a special occasion. Our 18 Birthday Rolled One Pint Pewter Tankard measures 5.11 inches tall by 3.14 inches wide. This one pint pewter tankard is a quirky and fun item that is specially designed to celebrate a special someone's 18th birthday. Our 18 Key Badge One Pint Pewter Tankard measures 5.11 inches tall by 3.14 inches wide. This makes them the perfect commemorative gift for landmark birthdays. This one pint pewter tankard is specifically designed to be the ideal gift. Our 21st Birthday Key Rolled Pewter Tankard One Pint measures 5.11 inches tall by 3.14 inches wide. Inspired by the traditional rhyme 'I've got the key of the door, never been 21 before'. Our 21 Key Badge One Pint Pewter Tankard measures 5.11 inches tall by 3.14 inches wide. This makes them the perfect commemorative gift for landmark birthdays. This one pint pewter tankard is specifically designed to be the ideal gift. Our Annwn Wedge Pewter Flask 6 Ounces measures 4.72 inches tall by 3.54 inches wide. We are strongly in favour of history and tradition driving design, and that can be seen in our range of beautiful Sporran style hip flasks. Our Antiquity Pewter Flask 6 Ounces measures 4.72 inches tall by 3.54 inches wide. This traditionally shaped six ounce pewter hip flask is a great example of a beautifully designed piece of pewter giftware. Our Cavalier C Handle Pewter Tankard One Pint measures 5.11 inches tall by 3.14 inches wide. All our pewter items are hand crafted from the highest quality lead-free pewter. Our Brass Lip and Base Straight Two Line Pewter Tankard One Pint measures 5.11 inches tall by 3.14 inches wide. This outstanding one pint pewter tankard demonstrates every inch of our craftsmanship. Our Barrel Shaped One Pint Pewter Tankard measures 5.11 inches tall by 3.14 inches wide. This barrel shaped one pint pewter tankard ticks both the boxes of utility and style, making it an all-around brilliant item. Our C Handle One Pint Pewter Tankard measures 5.11 inches tall by 3.14 inches wide. The straight sided body has a mirror-like finish that is only detailed by a few simple elements of horizontal line styling. Our Best Man Badge One Pint Pewter Tankard measures 5.11 inches tall by 3.14 inches wide. To thank those special people who make your wedding day a perfect occasion that you will remember forever. Our Best Man Words Pewter Flask 6 Ounces measures 4.72 inches tall by 3.54 inches wide. The 6 ounce pewter hip flask is all about modern styling to create an overall beautiful effect that makes for a great gift for the best man. Our Brass Plate Purse Pewter Flask 6 Ounces measures 4.33 inches tall by 3.54 inches wide. We have a long tradition in the pewter gift ware industry, and we are proud of the fact that some of our products exude traditional elegance. Our Brass Celtic Band Pewter Flask 4 Ounces measures 4.72 inches tall by 3.54 inches wide. If you are looking for a beautiful commemorative gift to mark a landmark birthday, graduation or special occasion. Our Cavalier Pewter Tankard One Pint measures 5.11 inches tall by 3.14 inches wide. 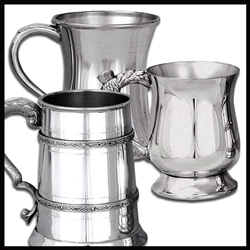 All All of Pewter Tankard items are lovingly manufactured from the highest quality lead free pewter. Our Cavalier Satin Band Pewter Tankard One Pint measures 5.11 inches tall by 3.14 inches wide. This one pint pewter tankard is designed with a Cavalier style body that blends nicely with the horizontal lines. Our Celtic Band And Celtic Lion Handle One Pint Pewter Tankard measures 5.11 inches tall by 3.14 inches wide. Pewter Tankards are an outstanding choice as a commemorative gift for a special birthday or notable achievement. Our Celtic Lion Double Band One Pint Pewter Tankard measures 5.11 inches tall by 3.14 inches wide. The straight sided body of the tankard has a highly polished finish that is broken at the top and bottom by Celtic style bands. Our Celtic Band One Pint Pewter Tankard measures 5.11 inches tall by 3.14 inches wide. This makes them the ideal commemorative gifts to mark special occasions, and this particular one pint pewter tankard is an especially ornate and beautiful example. Our Cavalier Half Pint Pewter Tankard measures 3.54 inches tall by 2.95 inches wide. If you are looking for a gift for any occasion that exudes class and quality, and shows that you really care then a half pint pewter tankard really fits the bill. Our Celtic Band Pewter Flask 6 Ounces measures 4.72 inches tall by 3.54 inches wide. If you are looking for a beautiful commemorative gift to mark a landmark birthday, graduation or special occasion. Our Celtic Knot Pewter Flask 6 Ounces measures 4.72 inches tall by 3.54 inches wide. Pewter is the fourth most precious metal in common usage, behind only platinum, gold and silver. Our Celtic Pewter Flask 6 Ounces measures 4.72 inches tall by 3.54 inches wide. This beautiful pewter hip flask offers the ideal combination of attractive design and space for personalisation, making it a perfect gift to mark any landmark birthday or special occasion. Our Celtic Knot Pewter Flask 4 Ounces measures 4.33 inches tall by 2.57 inches wide. This beautiful pewter hip flask sports an intricate and elegant Celtic knot design across the front. Our Celtic Pewter Flask 4 Ounces measures 4.33 inches tall by 2.75 inches wide. This beautiful pewter hip flask offers the ideal combination of attractive design and space for personalisation, making it a perfect gift. Our Celtic Knots Stamped Pewter Flask 6 Ounces measures 5.11 inches tall by 3.54 inches wide. This wonderful six ounce pewter hip flask has to rank amongst the most stylish and beautiful of our range, and truly is a wonderful gift for a loved one. Our Celtic Cross Top Pocket Pewter Flask 3 Ounces measures 5.90 inches tall by 1.77 inches wide. We love to marry elegant and sleek design with intricate and beautiful images, and that is exactly what you find with this pewter hip flask. Our Celtic Cap Top Pewter Flask 6 Ounces measures 5.11 inches tall by 3.54 inches wide. If you are looking for a beautiful commemorative gift to mark a landmark birthday, graduation or special occasion. Our Celtic Pewter Flask 6 Ounces measures 5.11 inches tall by 3.54 inches wide. If you are looking for a beautiful commemorative gift to mark a landmark birthday, graduation or special occasion. This wonderful Celtic Captive Top Pewter Flask six ounce pewter hip flask has to rank amongst the most stylish, and truly is a wonderful gift for a loved one to mark a landmark birthday or special occasion. The 13 cm by 9 cm pewter flask boasts an intricate and enchanting Celtic dragon style design which covers half of the front. Our Celtic Scene Pewter Tankard One Pint measures 5.11 inches tall by 3.14 inches wide. In the modern world where everything seems to be becoming more fleeting and disposable, the very best gifts are those that will last the test of time. Our Club Mount Pewter Tankard One Pint measures 5.11 inches tall by 3.14 inches wide. We have built a worldwide reputation as one of the world leading manufacturers of quality pewter gift ware. Our Double Celtic Band Pewter Tankard One Pint measures 5.11 inches tall by 3.14 inches wide. We use only the highest quality lead free pewter and manufacture all of our pewterware according to the traditional standards. Our Embossed Thistle Pewter Tankard One Pint measures 5.11 inches tall by 3.14 inches wide. Whether it is to celebrate Hogmanay or just to give a nod to someone's proud Scottish heritage. Our Celtic Scene Brass Lip and Base One Pint Pewter Tankard measures 5.11 inches tall by 3.14 inches wide. This one pint pewter tankard brilliantly combines an understated straight sided body with a brass lip and base. Our Cymru Dragon One Pint Pewter Tankard measures 5.11 inches tall by 3.14 inches wide. With the beautiful scenery of the valleys, an outstanding rugby team and the majesty of Snowdon, there is plenty to make you proud of Wales. Our Chamberlain Extra Heavy One Pint Pewter Tankard measures 5.70 inches tall by 3.14 inches wide. This one pint pewter tankard is composed of the thickest possible gauge of metal making it an extra heavyweight tankard that provides the most substantial possible feel. Our Concave One Pint Pewter Tankard measures 3.74 inches tall by 2.75 inches wide. This one pint pewter tankard gives an elegant and modern feel thanks its concaved edged body with horizontal line detailing and a highly polished finish. Our Double Celtic Brass Lip And Base One Pint Pewter Tankard measures 5.11 inches tall by 3.14 inches wide. This one pint pewter tankard brilliantly combines an understated straight sided body with a brass lip and base. Our Embossed Piper One Pint Pewter Tankard measures 5.11 inches tall by 3.14 inches wide. This Scottish piper one pint pewter tankard is the perfect wedding or birthday present for someone who is proud of their Scottish heritage. Our England Three Lion One Pint Pewter Tankard measures 5.11 inches tall by 3.14 inches wide. Display your proud patriotism with this handsome three lions England one pint tankard. Our Churchill Extra Heavy One Pint Pewter Tankard measures 7.87 inches tall by 3.54 inches wide. The traditionally beautiful appearance of the tankard is provided by a straight sided body with an impressive broad brass ring around the circumference. Our Fish Handle One Pint Pewter Tankard measures 5.11 inches tall by 3.14 inches wide. This high class pewter giftware will not tarnish, and in fact often improves with age, making it ideal for commemorative gifts to mark special occasions. Our Dad One Pint Pewter Tankard measures 5.11 inches tall by 3.14 inches wide. The tankard has a simple yet elegant straight edged body, which includes the word 'Dad' and can also have your own personal message. Our Feather Cymru One Pint Pewter Tankard measures 5.11 inches tall by 3.14 inches wide. With the beautiful scenery of the valleys, an outstanding rugby team and the majesty of Snowdon, there is plenty to make you proud of Wales. Our Double Celtic Band Half Pint Pewter Tankard measures 3.74 inches tall by 2.75 inches wide. This makes them the ideal commemorative gifts to mark special occasions, and this particular half pint pewter tankard is an especially ornate and beautiful example. Our Cross Golf One Pint Pewter Tankard measures 5.11 inches tall by 3.14 inches wide. This particular tankard combines this with a celebration of an equally proud tradition that can be found from the game of golf. Our Extra Heavy Gauge Balmoral One Pint Pewter Tankard measures 5.11 inches tall by 3.14 inches wide. This heavyweight tankard is a gift that offers some extra special regal style. Our Father of The Bride Badge One Pint Pewter Tankard measures 5.11 inches tall by 3.14 inches wide. This pint tankard, provides an elegant design that is completed by a square handle, horizontal line detailing and a 'Father of the Bride'. Our Father of The Groom Badge One Pint Pewter Tankard measures 5.11 inches tall by 3.14 inches wide. To thank those special people who make your wedding day a perfect occasion that you will remember forever. Our Extra Heavy Montgomery One Pint Pewter Tankard measures 5.11 inches tall by 3.14 inches wide. The beautiful one pint tankard has a straight sided body that is given a traditional feel by the horizontal line detailing at the top and bottom. Our Extra Heavy Gauge Mountbatten One Pint Pewter Tankard measures 5.11 inches tall by 3.14 inches wide. Pewter is the fourth most precious metal in common usage, behind only platinum, gold and silver. Our Corner Thistle Stamped Pewter Flask 6 Ounces measures 5.11 inches tall by 3.74 inches wide. This particular six ounce flask is beautifully decorated in the bottom left hand corner by a stylized Scottish thistle. Our Diagonal Satin Band Pewter Flask 6 Ounces measures 4.72 inches tall by 3.54 inches wide. The elegant six ounce hip flask has the traditional rectangular shape, and features a diagonal satin band running around the center. Our Celtic Tall Pewter Flask 8 Ounces measures 5.90 inches tall by 3.54 inches wide. This beautiful pewter hip flask offers the ideal combination of attractive design and space for personalisation, making it a perfect gift. Our Embossed Piper Pewter Flask 6 Ounces measures 4.72 inches tall by 3.54 inches wide. With iconic and beautiful scenery, the majesty of Edinburgh Castle and hundreds of years of history and tradition there is plenty to love about Scotland. Our Celtic Pewter Flask 6 Ounces measures 5.11 inches tall by 3.54 inches wide. If you are looking for a beautiful commemorative gift to mark a landmark birthday, graduation or special occasion, then you need look no further than this stylish Celtic style six ounce pewter hip flask. Our Cymru Dragon Pewter Flask 6 Ounces measures 4.72 inches tall by 3.54 inches wide. We are proud of our history and tradition, and if you have a loved one who is equally proud of their Welsh roots. Our Celtic Rose Collection is this stylish Celtic pewter hip flask. Manufactured using only the highest quality lead free pewter, the flask will not tarnish over time and is also perfectly placed to have your own choice of engraving added to make the gift truly unique. This particular flask is beautifully decorated by an intricate Celtic copper band. Our Celtic Rose Collection, the circular style flask features an eye-catching Celtic knot badge in the centre that stands out even more thanks to the mirror-like finish of the rest of the flask. An ideal commemorative gift for a loved one who is fond of a snifter of whisky every once. If you are looking for a beautiful commemorative gift to mark a landmark birthday, graduation or special occasion, then you need look no further than this stylish Celtic Pewter Hip Flask style six ounce pewter hip flask. Manufactured using only the highest quality lead free pewter, the 13 cm by 9 cm flask will not tarnish over time. If you are looking for a beautiful commemorative gift to mark a landmark birthday, graduation or special occasion, then you need look no further than this stylish Celtic style six ounce pewter hip flask. Manufactured using only the highest quality lead free pewter, the 13 cm by 9 cm flask will not tarnish over time. Our Guinness Pewter Tankard One Pint measures 3.94 inches tall by 3.14 inches wide. All of our tankards share the same high standards of craftsmanship and longevity but in terms of design and appearance the beautiful one pint tankard offers you something just that little bit different. Our Georgian Pewter Tankard One Pint measures 5.11 inches tall by 3.25 inches wide. There are few tankards which evoke feelings of beauty, history and elegance better than this beautiful one pint pewter Georgian style tankard. Our Georgian Handle Pewter Tankard One Pint Plain measures 5.11 inches tall by 3.14 inches wide. If you are looking for a gift for any occasion that exudes class and quality, and shows that you really care then a pint pewter tankard really fits the bill. Our Georgian Handle Half Pint with Straight Two Lines Pewter Tankard measures 3.74 inches tall by 2.95 inches wide. This beautiful half pint tankard complements a mirrored finish to its straight body with two horizontal detailing lines at the top and bottom. Our Georgian Handle with Brass Plate Straight Pewter Tankard One Pint measures 5.11 inches tall by 3.14 inches wide. We pride ourselves on offering the very best pewter giftware to suit any and all occasions. Our Georgian Pewter Tankard Half Pint measures 3.93 inches tall by 2.95 inches wide. This wide half pint tankard is styled with a traditional curved body sitting on a plinth style base that creates the effect of a medieval style goblet. This stirrup cup is approximately 4 inches tall and features a hare's head base which is both striking and can also be used to stand the cup on a flat surface. This stirrup cup is approximately 4 inches tall and features a fox head base which is both striking and can also be used to stand the cup on a flat surface. Our George III Heavy Gauge One Pint Pewter Tankard measures 4.72 inches tall by 3.14 inches wide. This George III style tankard is something a little bit different from combining the substance of our other heavy weight tankards. Our Half Hammered One Pint Pewter Tankard measures 5.11 inches tall by 3.14 inches wide. This gorgeous one pint half hammered tankard, features a sleek and stylish straight body. Our Harp Slainte One Pint Pewter Tankard measures 5.11 inches tall by 3.14 inches wide. For those with Irish roots or an emotional connection to the emerald isle this tankard is the perfect pewter tankard to receive as a gift. Our Heavy Gauge Henry One Pint Pewter Tankard measures 5.11 inches tall by 3.14 inches wide. Inspired by the opulent banquets of the Tudor age, this one pint pewter tankard gives off an unmistakable aura of excellence. Our Fox Handle One Pint Pewter Tankard measures 5.11 inches tall by 3.14 inches wide. This innovative one pint tankard has a straight body which is both understated and stylish thanks to the horizontal line detailing found at the top and bottom of the tankard. Our Heavy Gauge Jacobean One Pint Pewter Tankard measures 5.51 inches tall by 3.54 inches wide. Heavier and more substantial than a standard tankard, the one pint Jacobean pewter tankard is the ideal commemorative gift. Our Golf Handle One Pint Pewter Tankard measures 5.11 inches tall by 3.14 inches wide. Why not make the 19th hole extra special for your golf loving loved one, by treating them to this outstanding golf themed one pint pewter tankard? Our Full Hammered One Pint Pewter Tankard measures 5.11 inches tall by 3.14 inches wide. This one pint tankard offers something that little bit different thanks to the hammered effect that adorns the majority of the item and gives a retro and eye catching effect. Our Heavy Gauge Avalon One Pint Pewter Tankard measures 5.51 inches tall by 3.14 inches wide. This one pint tankard is a gorgeous and attractive pewter tankard that is a perfect gift for any recipient on any special occasion. Our Georgian Handle With Brass Band and Base One Pint Pewter Tankard measures 5.11 inches tall by 3.14 inches wide. Less sometimes really can be more, and while the one pint tankard doesn't feature any individually striking elements, the overall effect is truly eye-catching. Our Heavy Gauge Best Man One Pint Pewter Tankard measures 5.11 inches tall by 3.14 inches wide. Your special day can only be so special if your loved ones are there beside you. Our Handcuffs Handle One Pint Pewter Tankard measures 5.11 inches tall by 3.14 inches wide. The very best gifts are those which really reflect the lucky recipient. Our Heavy Gauge Glastonberry One Pint Pewter Tankard measures 5.11 inches tall by 3.14 inches wide. In the modern world where everything seems to be becoming more fleeting and disposable, the very best gifts are those that will last the test of time. Our Heavy Gauge Celtic Tor One Pint Pewter Tankard measures 5.51 inches tall by 3.14 inches wide. The Celtic Tor one pint tankard is a gorgeous and attractive pewter tankard that is a perfect gift for any recipient on any special occasion. Our Georgian Thistle Handle One Pint Pewter Tankard measures 5.11 inches tall by 3.14 inches wide. There are few tankards which evoke feelings of beauty, history and Scottish pride better than this beautiful one pint pewter Georgian thistle tankard. Our Heavy Gauge Dragon One Pint Pewter Tankard measures 5.90 inches tall by 3.14 inches wide. If your loved one is a fan of Lord of the Rings, Game of Thrones or the fantasy genre in general then the heavy weight dragon handle one pint pewter tankard is one to have. Our Football One Pint Pewter Tankard measures 5.11 inches tall by 3.14 inches wide. Tankards are a great gift to mark a special occasion or to celebrate an achievement. Our Heavy Gauge Celtic Band One Pint Pewter Tankard measures 5.51 inches tall by 3.54 inches wide. Our tankards really make you sit up and take notice, and that is certainly true of the heavy weight one pint pewter tankard. Our Heavy Gauge Highland One Pint Pewter Tankard measures 4.92 inches tall by 3.14 inches wide. The style and elegance of this traditionally styled heavyweight one pint pewter tankard is the perfect gift for a loved one. Our Hammered Purse Pewter Flask 6 Ounces measures 4.72 inches tall by 3.54 inches wide. By always seeking to produce the highest quality and most original pewter ware, we can offer our customers. Our Hammered Purse With Captive Top and Pouch Pewter Flask 6 Ounces measures 4.72 inches tall by 3.54 inches wide. By always seeking to produce the highest quality and most original pewter ware. Our Hammered Satin Band Pewter Flask 6 Ounces measures 4.72 inches tall by 3.54 inches wide. With a long history and tradition within the pewter gift ware industry, we pride ourselves on crafting the most attractive and highest quality pewter hip flasks. Our Hammered Satin Band Pewter Flask 4 Ounces measures 4.33 inches tall by 2.75 inches wide. This elegant hip flask has the traditional rectangular shape, and features a satin band running around the center. Our Half Hammered Pewter Flask 6 Ounces measures 4.72 inches tall by 3.54 inches wide. This has certainly been achieved with the gorgeous six ounce pewter hip flask that boasts an attractive appearance. Our Heart Shaped Pewter Flask 6 Ounces measures 3.93 inches tall by 4.33 inches wide. Show someone special to you exactly how you feel with this innovative and beautiful heart shaped pewter hip flask. Our Gwenhwyfar Stamped Pewter Flask 6 Ounces measures 5.11 inches tall by 3.54 inches wide. Using only the highest quality pewter and traditional craftsmanship, we are the world renowned manufacturers of the very best pewter gift ware. Our Harp Stamped Pewter Flask 6 Ounces measures 4.72 inches tall by 3.54 inches wide. If you have a loved one who partakes of an Irish whisky, or who is proud of their Irish heritage then this flask is a thoughtful and beautiful gift for them that will suit any occasion. Our Golf Scrimshaw Pewter Flask 6 Ounces measures 4.33 inches tall by 3.54 inches wide. We love to produce the highest quality pewterware that has a story to it, or includes a nod to history and that is exactly what you get from our range of Scrimshaw pewter hip flasks.